Hailing from Australia, Dr. Huilgol received his Bachelor of Medicine and Bachelor of Surgery degree at Flinders University of South Australia. Following medical school he was an Instructor in Aviation Medicine in the Royal Australian Air Force (RAAF), completing courses in aero-medical evacuation and aviation medicine. He qualified to run an altitude chamber and was promoted to be the Senior Medical Officer of the RAAF Base in Darwin. He received commendations from the U.S. and visiting forces during Kangaroo ’89 – the largest multi-country military exercise held in the Southern Hemisphere since WWII. After his voluntary service in the Air Force, he worked as a primary care physician in Adelaide, Australia before coming to the United States to pursue specialty training. He did his Internal Medicine residency and initial Gastroenterology Fellowship at the Aurora-Sinai Program in Milwaukee, WI affiliated with the University of Wisconsin. He completed his Gastroenterology Fellowship at the Medical College of Wisconsin and also completed an additional fellowship of Advanced Gastroenterology Training at the LSU Health Sciences Center in Shreveport, LA. Following fellowship, while in Shreveport, he was promoted to Chief of Gastroenterology and Hepatology at the Veterans Administration Medical Center (VAMC). Later at the VAMC in Roseburg, Oregon he held various leadership positions including Chief of Gastroenterology, Chief of Internal Medicine and acting Chief of Staff. 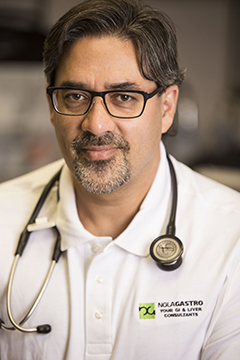 Most recently, Dr. Huilgol worked as a Gastroenterologist at Ochsner Health System in Baton Rouge, before leaving to form his own private practice in New Orleans, NOLA GASTRO, and has staff privileges at the Touro Infirmary. He has professional memberships in the AASLD, ACG, AMA and the ASGE.